Another lazy day is spent in Bagan, beginning with the interminable breakfast session, discussing my Polish heritage with the wry young Pole, who takes a somewhat humorous view of my outlandish account. As much as some decry the negative turns of history, the story of Poland is one of tremendous optimism, given the duress the country has experienced for centuries, and not only has it gained its liberties, but the country has become one of the leading emerging economies of the EU, and a consummate counterpoint to the likes of Greece. Poland has turned away from Russia altogether and now is an ostensibly close partner of its former nemesis, Germany. Shifting gears, I speak with an Englishman originally from Newcastle, who spent the latter half of his life in Somerset. He seems somewhat disconsolate about the idea of having to find accommodation in this overpriced town, but then as I continue speaking with him, it seems to reflect his life in general. As we chat, he seems warmed by my familiarity with his home, however, he has abandoned England altogether, having moved to Taiwan to teach English as second language. After 14 years of living in Asia, he is no longer comfortable with the idea of living in the country of his origin, nor could he afford to live there anyway. The conversation switches into an entirely different direction, this time with the young headscarved woman seated on the bench next to the reception. The young female receptionist is all ears as I subject the seated woman to a tirade about the wonders of her country Malaysia. Malaysia is a paradoxical country, full of contradictions and unfortunate disenchantments, but at the same time a diverse, successful and vibrant country in a way that few other countries in Asia are. For reasons I can’t explain very well, I am infatuated with Malaysia and its people, and the eastern part of the country is a highlight for me. It helps that she is originally from Kota Baru, which I rave about, be it the artisanal traditions, the food, the people and so on. 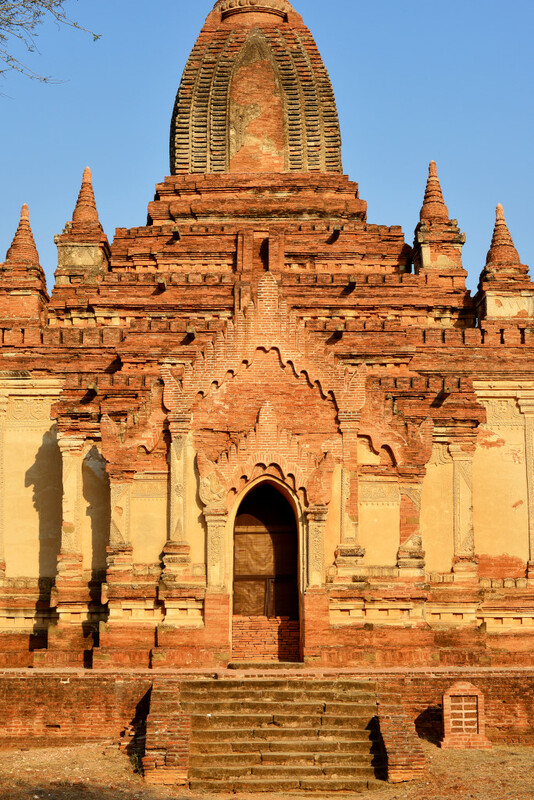 The poor woman feels overwhelmed by my ranting, then it turns out that she has one day to see Bagan in her 10 day trip through Myanmar, and I have wasted a good 3/4 hour of her day. Even worse, she will be bicycling around in the heat. I feel terrible as it is so hot here, although perhaps it won’t be so hard for her, as she comes from Malaysia which is boiling hot all the time anyway. 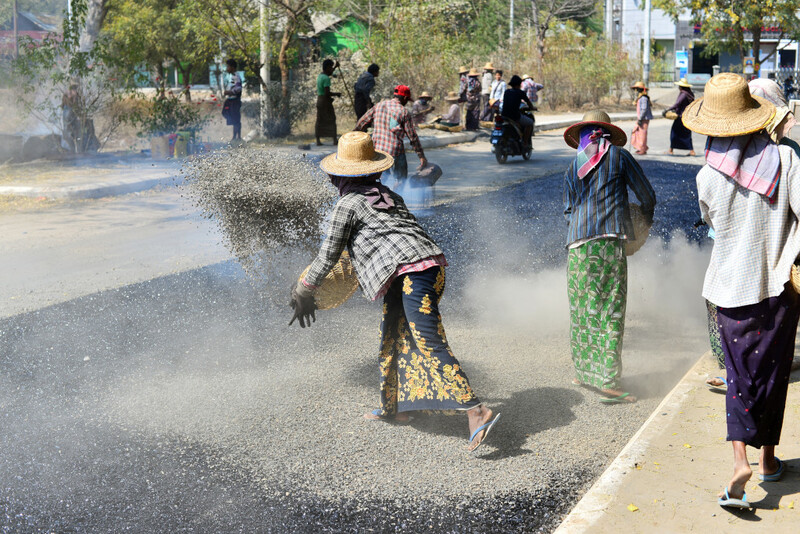 On the road, I am greeted by the sight of a crew of small, heavily swathed and bamboo-hatted workers pouring strips of liquid asphalt onto the ground, onto which others are tossing baskets of gravel. 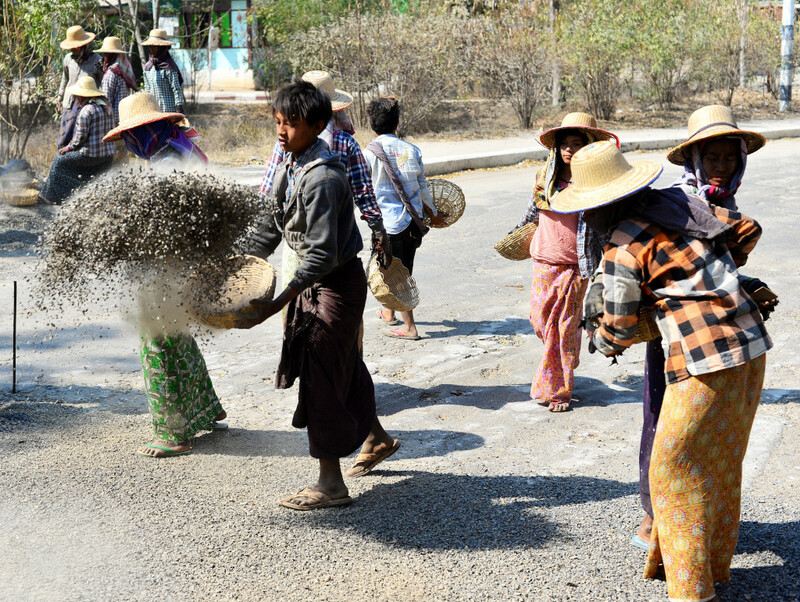 This is classic chain gang work, and it feels somehow humiliating to even be taking photos of the people, although knowing the Burmese, they probably don’t even care. 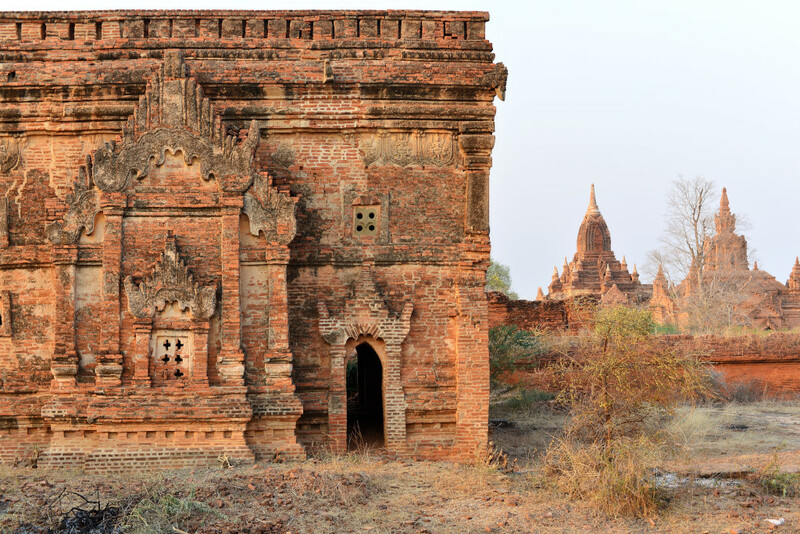 But the scene of hardship underlines the realities that most people in this country face, which is a far cry from posing for sunset shots on top of historic temples at Bagan. The small eatery I continue on to near the market is nothing to write home about, full of young students and what may be hipsters looking to gain some street cred hanging out for reasons unknown. Even more bizarre, the tiny young waiter wearing a wife beater, with muted orange hair and peeling green fingernail paint seems enthralled with my presence to the point that he is videotaping me at the table. He must be very desperate for entertainment. On the other hand, I can’t imagine the circumstances of the workers here could be that positive, given how life for most people in this country is one of hardship and lack of hope. More prosaically, I just want some tea leaf salad and wouldn’t want to risk eating anything else in this triste place. My immediate goal following breakfast is getting to one of the bicycle rental shops in Nyaung U that would have a larger bicycle. By the look of things, however, all the bikes available are smaller, and the one model abounding that may have a larger frame has a chain guard that I don’t want to take a risk with again. The owner of the shop next to the Eden Motel II is only too happy to unload his bike for a paltry 1,000 kyat, and then I am off down the road leading to the airport and the bus terminal I reluctantly trudged up several days ago. Time has dragged out as usual, and by the time I am finally ready to leave for the obligatory temple viewing, it is already early afternoon, just the perfect time to get roasted alive in this climate. 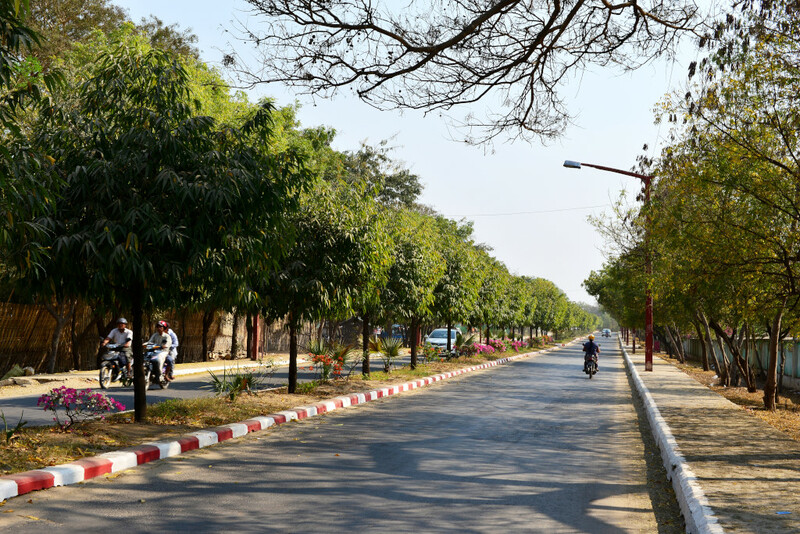 The road leading out of town is lined with a row of trees of equal height, growing alongside low flowering bushes. 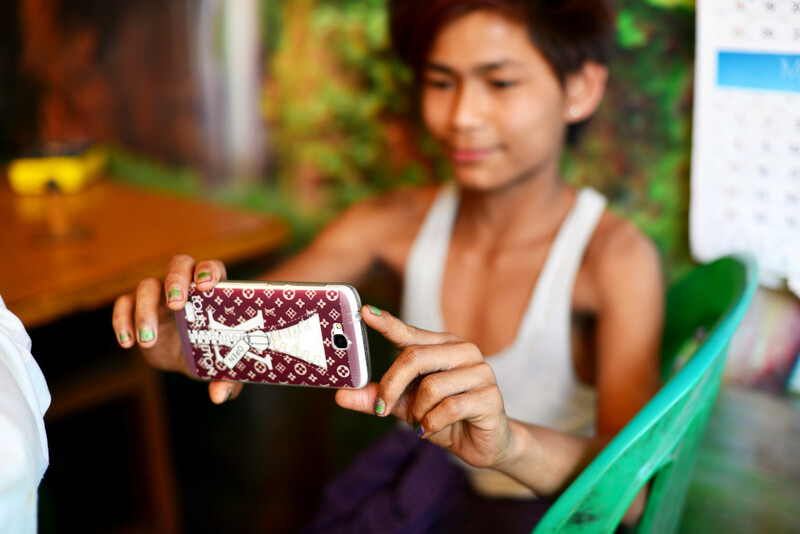 It represents a testimony to the image that Myanmar wants foreigners to see that in few ways represents the realities of the rest of the country. 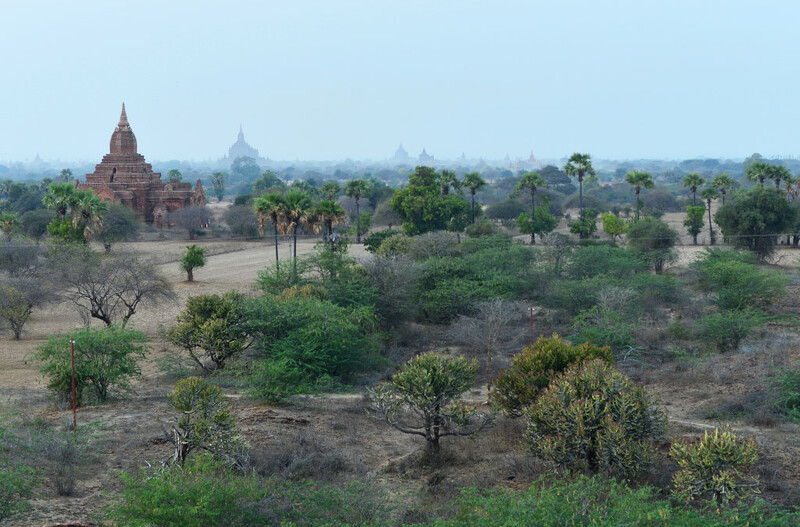 Branching off onto the road heading towards the golf course, I enter the parched world of sugar palms, fallow rolling fields, and deserted stupas dating to ancient times. 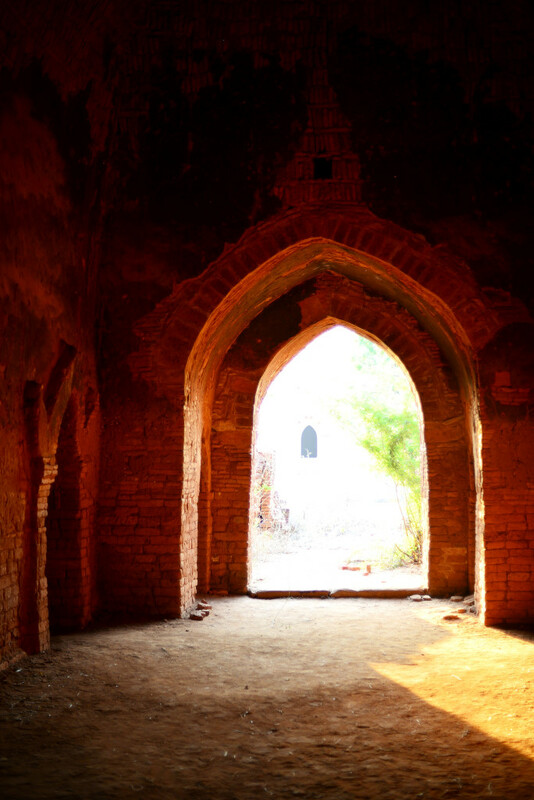 I continue along the dusty paths to some structure standing regally by itself, flanked on three sides by shallow porticos and a principal entry leading to a statue of Buddha in the typical Bhumisparsha mudra, with one hand facing palm towards the ground and the other palm resting on the lap and facing upwards. In case of larger structures, there could be a statue of Buddha facing every entrance, typically a very rudimentary painted stone figure. One cream stupa is the centre piece of the first site I visit, and may be a contemporary temple inasmuch as there are there barking dogs, aggressively approaching, then frantically running back to some shelter the moment they come in visual contact. 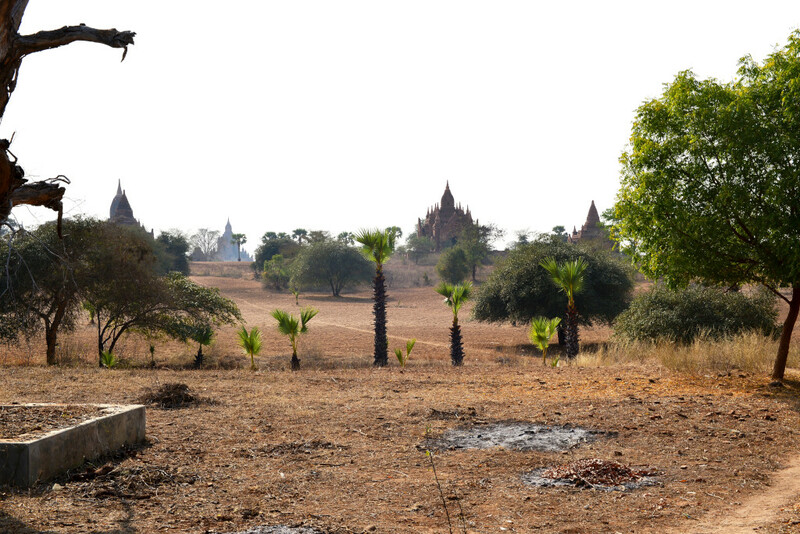 It seems the ochre stupas across the parched fields now bereft of any plaster protection could comprise the Ale Ya group, although the signage is largely unclear and if present, usually does not correspond to the tourist maps. The landscape here is rolling and stark, but dramatic nonetheless. The ancient terracotta structures stand out against the earthen fields and olive green of the sparse tree canopy. 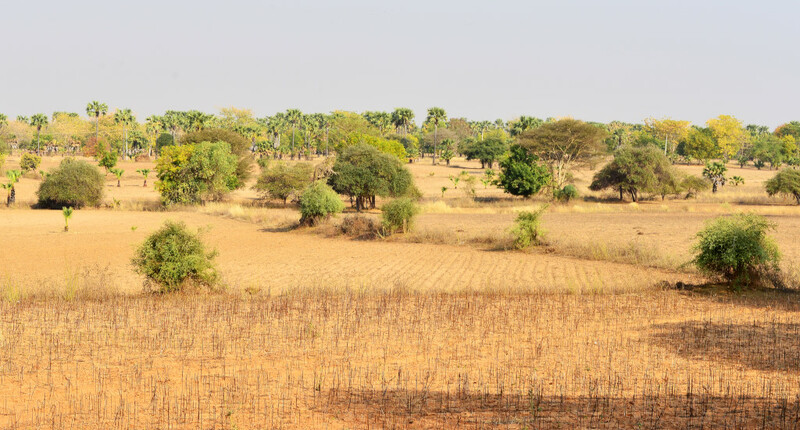 One type of tree here grows amidst the acacia-like greenery, appearing to be cultivated in the middle of nowhere, although the area spanning the temples is in fact crop land, and the trees belong to landowners who receive money from the people who cull the fruit and sell it on the market. One of the lone locals I encounter on the journey through the bleached landscape is a woman swathed in fabric driving a big herd of cattle, which would presumably belong to a variety of farmers. Trying to ride a bike through the sandy terrain is almost hopeless, what with all the slipping and sliding. It’s just easier to push the bike, although that is hardly ideal either, given the increasing heat. The ancient temple structures appear to float amidst the barren fields, with low spires reaching to the sky and flanked by low trees. I wonder what the likelihood of encountering some scorpion or snake would be, moving through the low scrub, even though the ground appears largely barren. At the Tham Bula paya I encounter a sign of life, a few locals half-heartedly trying to sell their wares. In theory, the potential exists to make a reasonable living, but the reality for these people offers anything but. It is heart-breaking to see the people trying to promote wares that pretty well most vendors sell, not that any of it is junk. The prices being asked for the crafts are fairly trivial, although expensive compared to what such crafts used to sell for, albeit eons ago. The advantage of trying to sell at the larger temples is that many tourists arrive, although there is also a lot of competition. Here there is no competition, but also next to no visitors. 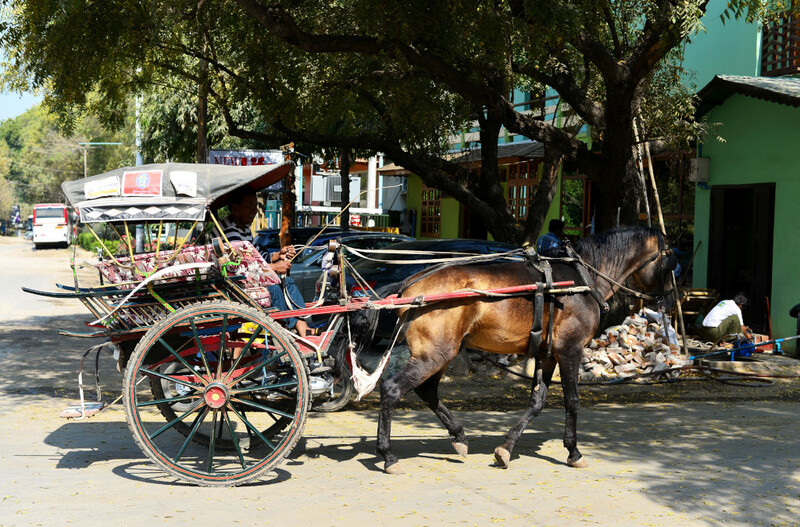 A few more tourists arrive in taxi, the fattened drivers lazing about as the tourists take their pictures, the vendors trying discretely to draw the attention of the visitors, who automatically block out their imploring voices after having visited a few of the temples. One of the vendors offers to unlock one of the temples to see the paintings, although I have no interest of getting into the clutches of his ilk. Several French tourists arrive by bicycle, the man pointing his point-and-shoot camera at himself while intoning a narrative. How painfully pretentious! On the other hand, the upside of seeing virtually no tourists is that you also don’t see the obsessed selfie crowd, this man being a rare exception. 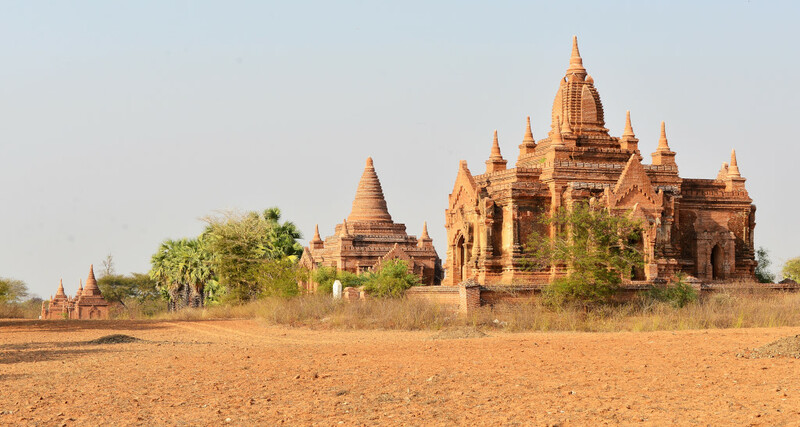 The same is also true about the Burmese tourist hordes which are nowhere to be seen on this holiday day, as they are probably visiting the important temple complexes closer to the core of Old Bagan. Not only are the temple exteriors fairly similar other than the size, they also feature little in terms of ornamentation either inside or out. 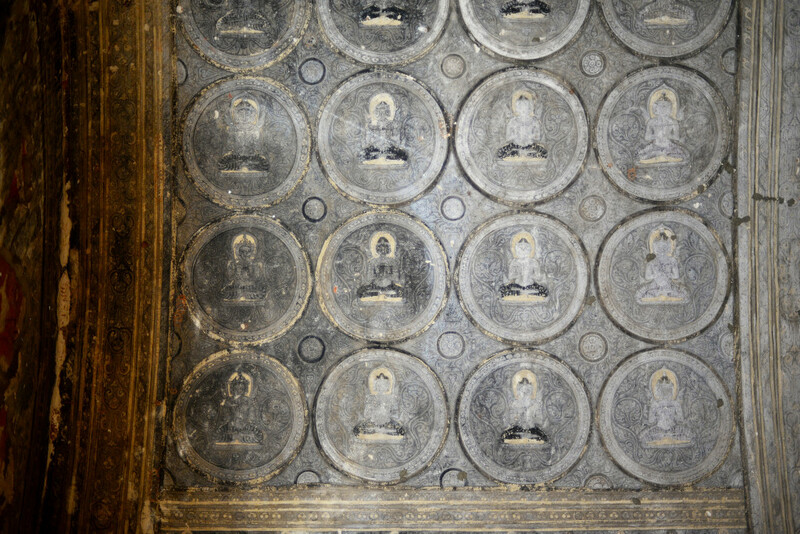 Occasional decorative medallions lie nestled along varying segments of the walls. 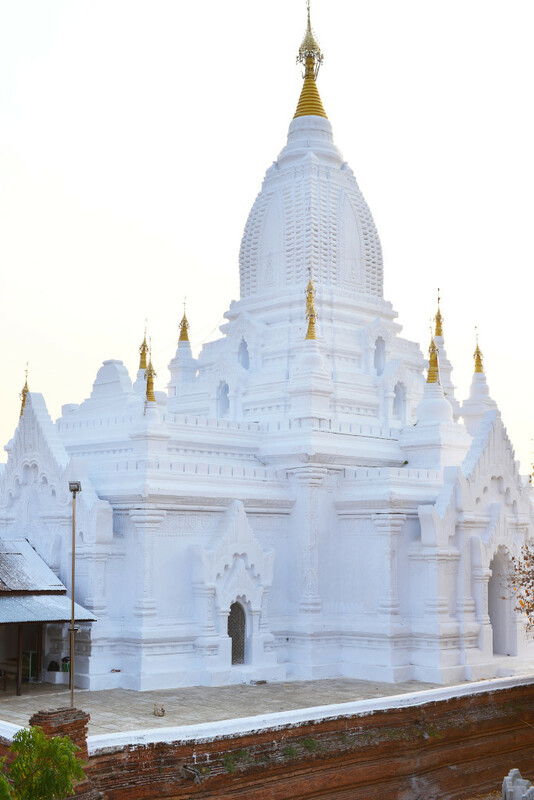 The Thon Zu Paya seems to depart from the classic symmetrical stupas of purely Buddhist character in that the triple stupa would seem to indicate the Hindu tripartite of Shiva, Vishnu and Brahma. 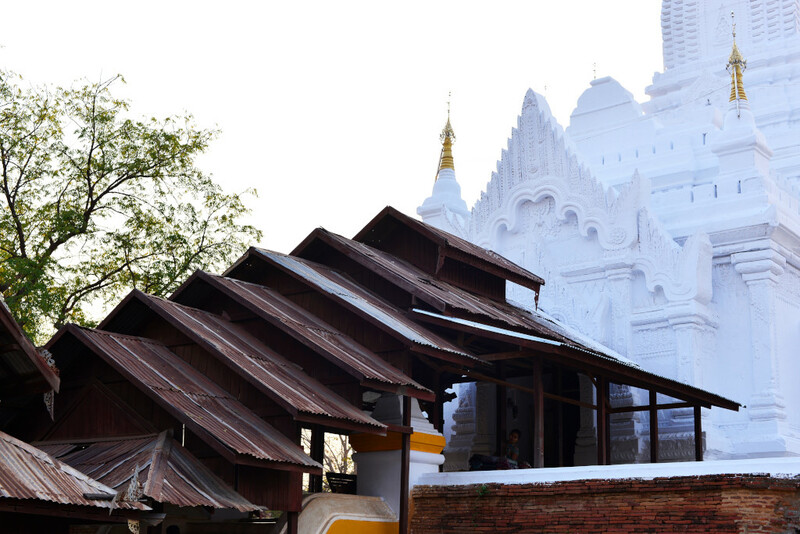 Nearby lies the larger Tayok Pyi Paya. 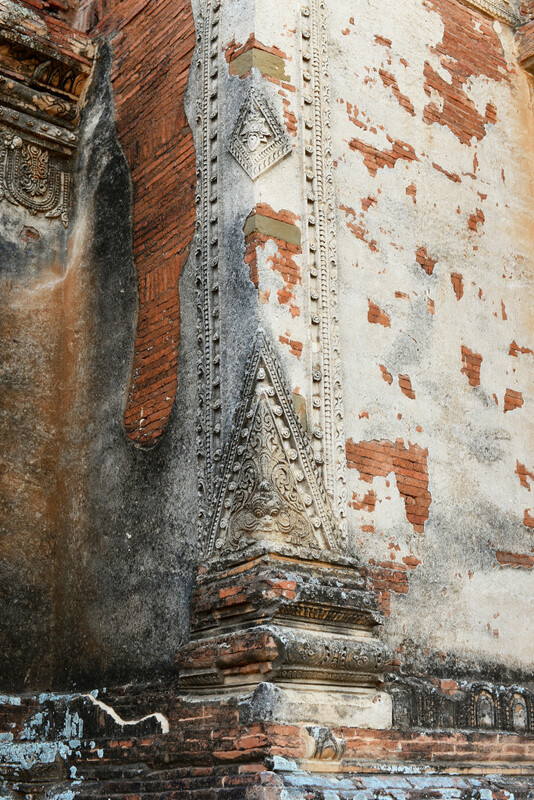 Unusual for this temple are the coffered inserts encircling the lower facade, featuring small pale green medallions, the only remaining evidence of colour on these structures, whose paint would have vanished eons ago. A man is busily engrossed in composing a decorative painting in front of him in the temple entrance, presumably along traditional lines on a stretched-out canvass. His mannerisms are charming, and as talented and sincere as he may be, he still needs to sell his pieces to the few tourists that make it through here. 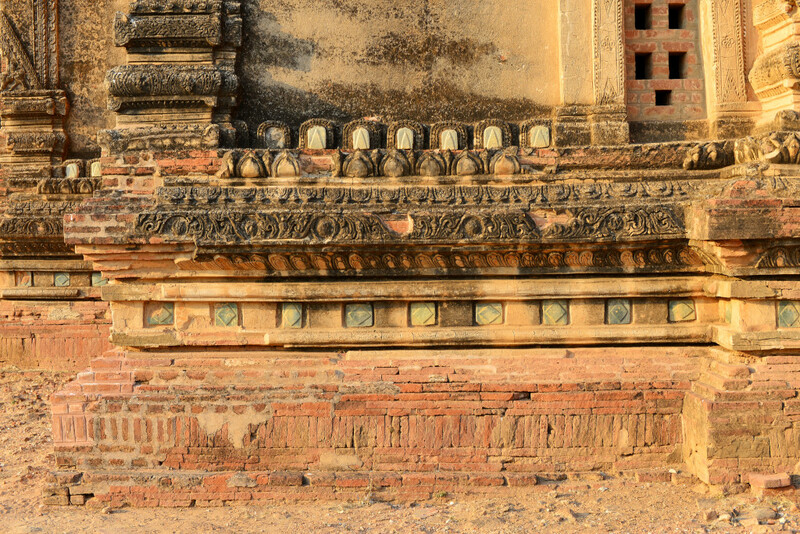 Most tourists come with guides who explain the nature of the structure in typically quite broken English, although with the vast number of virtually identical temples at Bagan, I can’t really see the benefit of learning about the minutiae as to which king, queen or noble built which structure in which year. 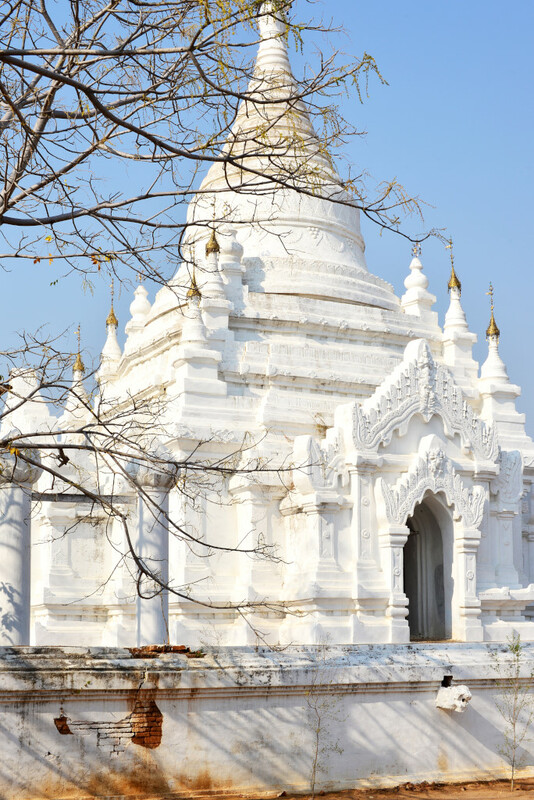 The central stupa at the Lay Myet Hnar Complex is whitewashed, with golden finials lining the rooftop, completely different in presentation from its kindred temples. The flurry of golden leaves painted across the neighboring tree creates a stunning visual counterpoint to the temple. 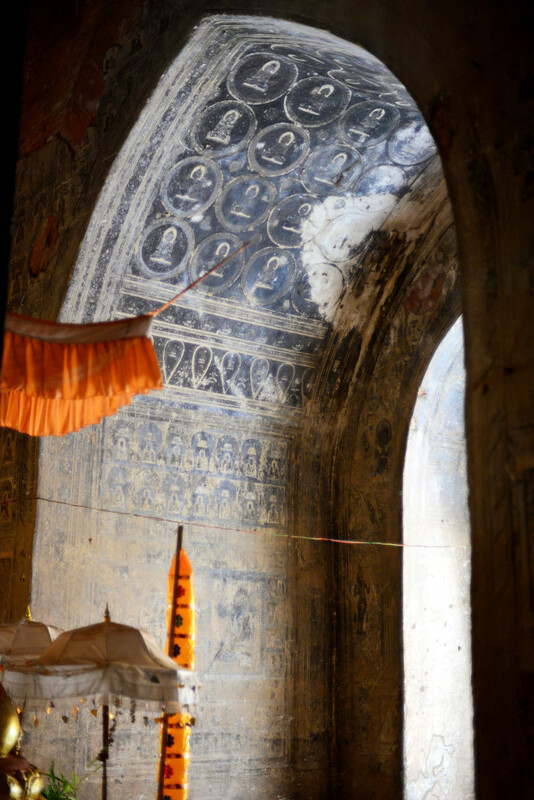 The typical Burmese terraced canopy covers the stairs leading to the main entrance, where a few vendors attempt to sell their wares in front of the building, and inside, an older man dodders after me, intent on explaining some obvious aspects of the grid of small Buddhas painted against in the internal arches and across the walls. In general, the locals attempting to sell their crafts here are relatively respectful and low key, no evidence of aggression anywhere, really just trying to make a living in a dignified way, but responding to every person imploring you to buy becomes tedious after a while. 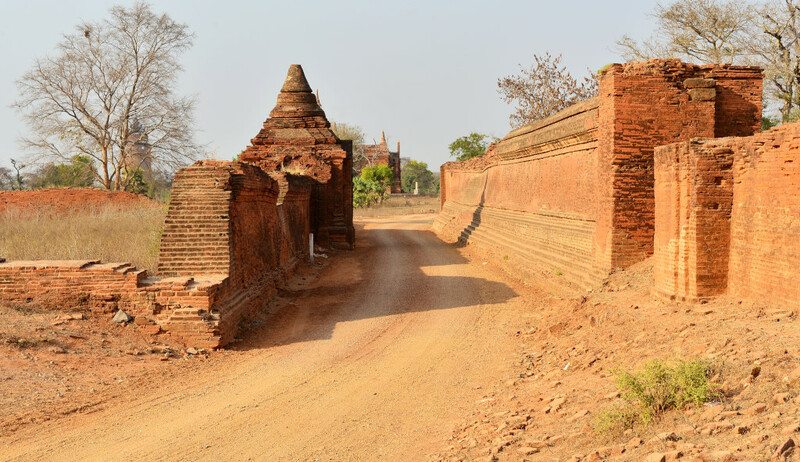 I continue on to a few more small stupas, then careen back to the main road, heading towards New Bagan, situated along the Irrawaddy river on the far side of old Bagan from Nyaung U. 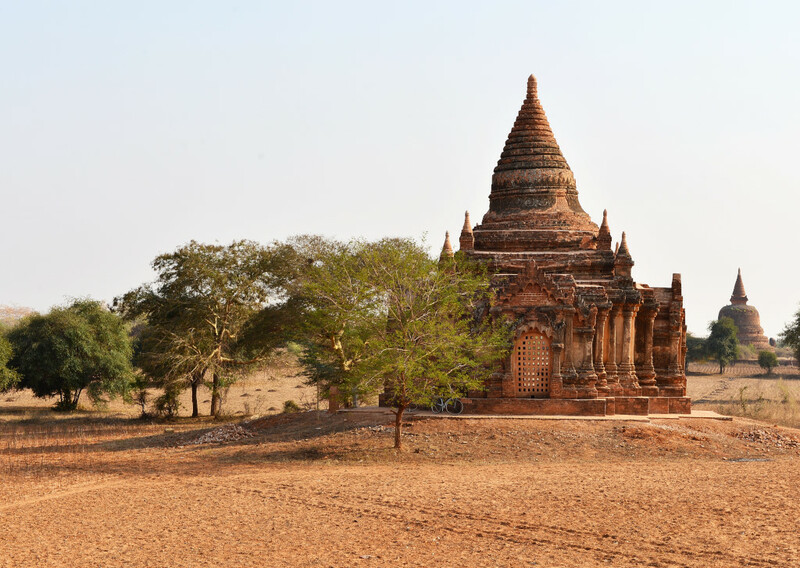 The intent is to spend that special sunset moment at just the right structure, one of the big selling points for visiting Bagan. Careening along another sandy path leading from the main road, a suitably large structure appears, already shrouded in darkness, the departing Burmese vendors pointing dismissively in the direction of the staircase to the upper terrace. 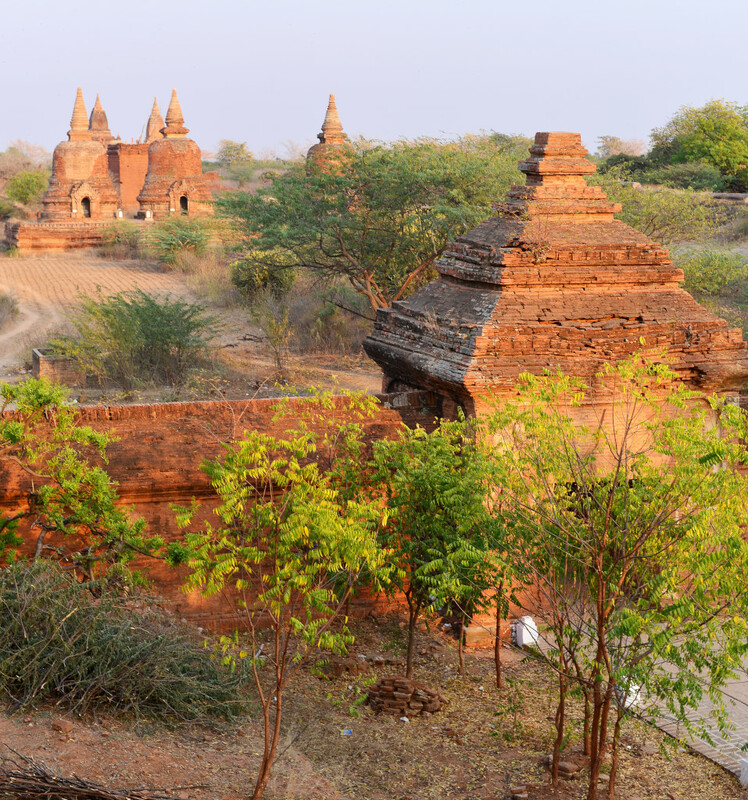 Ascending, I behold the vast panorama of stupas and green before me, the larger temples looking out over the landscape in their regal state, the bleached colours of midday now enriched to dark browns and greens. A handful of somewhat colourful backpackers in their token Burmese clothing fresh off the plane from the like of Ibiza or Goa wait with baited breath for the anticipated moment. 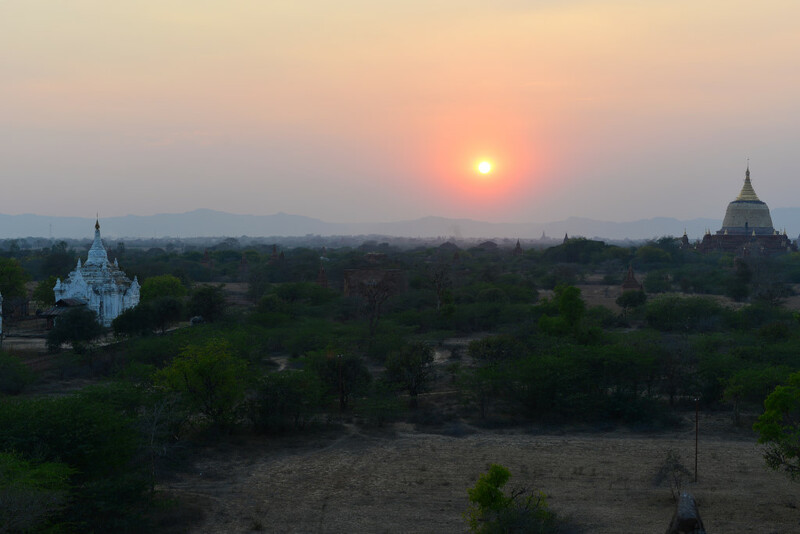 Of course, watching the sunset here is spectacular, just as the sunsets in Cambodia were spectacular. I decide to make a last effort to sightsee despite being quite far from Nyaung U, and not having lights on the bike. 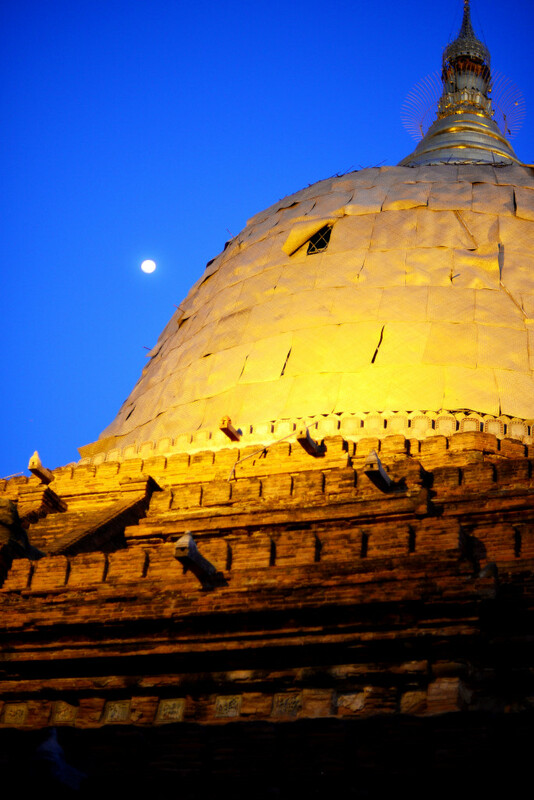 The dome of the Dhamma Yangyi Paya rises majestically above the landscape, but on closer inspection, it appears that the golden panels that comprise the dome are being removed and replaced. Nonetheless, the effect of the huge golden dome towering above against the now nearly full moon is spectacular. And the vendors who have patiently survived another day attempting to sell their modest wares pack up their belongings in a combination of resignation and relief. New Bagan in contrast is somewhat nondescript, despite being the apparent home of all the luxury hotels servicing Bagan. The hotels I pass by are definitely on the posher side, but nothing looks particularly earth-shattering, just larger, more tasteful, evoking an 80’s European middle class living room aesthetic, which is probably quite intentional, considering the intended clientele. 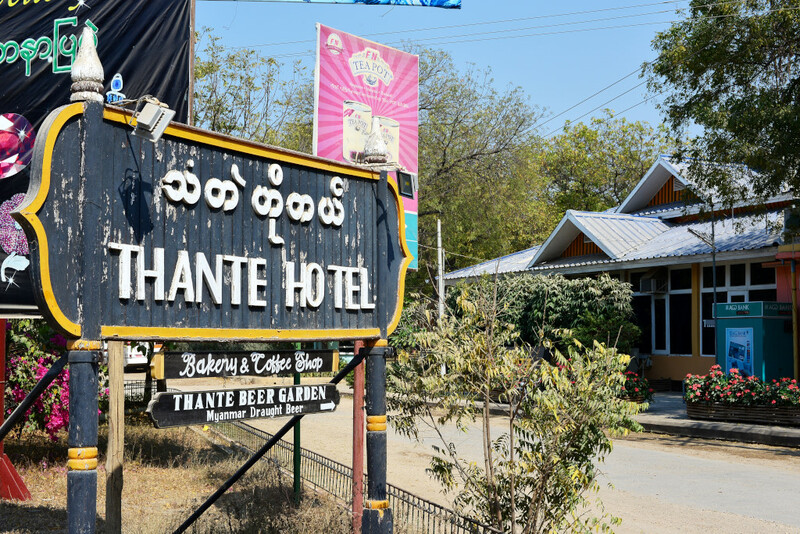 The hotels don’t adhere to the town in any kind of cohesion, sooner just compounds independently strung together, with smaller local eateries tossed in along the roadside for good measure, with token accommodation of western sentiments, rife in English signage and gaudy references to Bagan’s legacy. I imagine the tour groups will be eating in their hotels, while the small numbers of independent travelers will be dining in the roadside eateries. I would love to not be eating Chinese or Burmese food for dinner, but nothing here is particularly inspiring, especially considering that you would be paying a lot more for the pleasure. 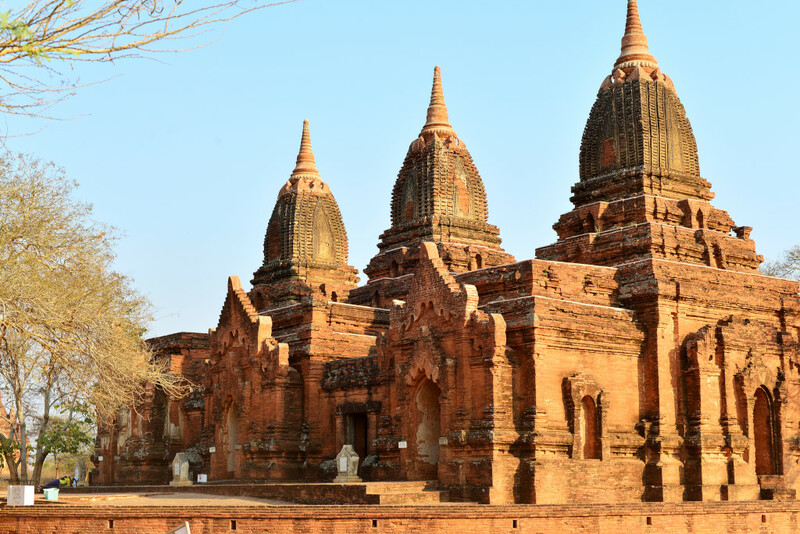 The last stop is the Mingala Zedia, a large square, squat and illuminated mouldering structure with golden finials running across the upper levels, the structure more of a mosque in feeling than Buddhist temple. 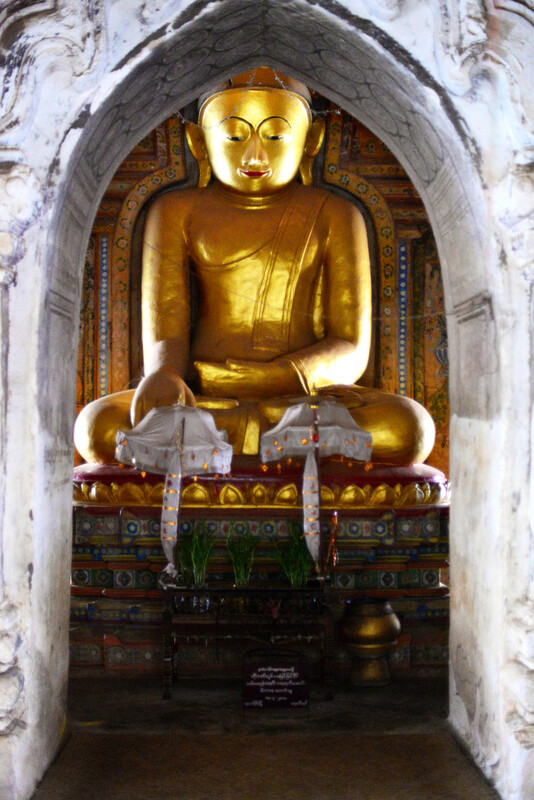 That notion in no way convinces the hordes of Burmese tourists to stay away, gathering maniacally in front of the giant golden Buddha sandwiched in the narrow cavity at the centre of the temple. Bus load upon bus load spews its thick black fumes into the parking area. With no decent eating option at the temple, I am obliged to embark on the long bike ride back to Nyaung U, and it is a much longer trip than the map would suggest. On the other hand, it is a relief to be able to stretch the legs and ride in the darkness in the cleaner and cooler evening air, despite the fact that the bicycle is far too small, and will probably wreak havoc on the knees.